ComfortableConservatories. 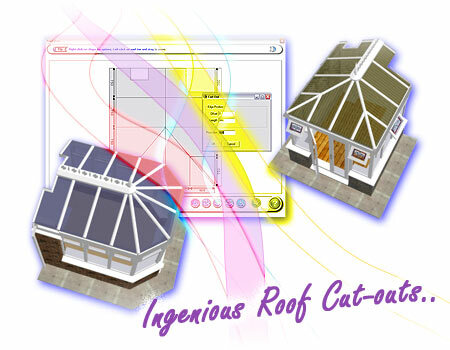 New features that were introduced in version 2, for the window door & conservatory industry. Can't wait to try? Click here for the risk-free fully 14 Day free trial! ComfortableConservatories v2 introduced numerous handy, intuitive and time-saving features, greatly expanded to help you move forward. Below you can learn of the key options introduced in version v2. This powerful new 'Roof cut out' option allows you to cut sections from any roof design on the system to allow for chimney breasts and more. How far the cut out will project in to the conservatory. Any number of cut outs can be configured per conservatory allowing for corner cut outs, and cut outs that dissect the ridge amongst others! The cut outs are also displayed on line drawings and overlays. This amazing new option allows you to add a selection of 3D objects to the scene, either inside or outside of the conservatory. An ideal way to show your customers how much room they can expect to see in their conservatory after furniture has been added. 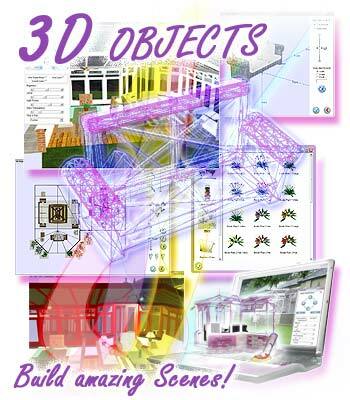 3D objects included range from sofas, chairs, tables, plants, radiators, dog kennels etc, to even a bird table! Many objects can be added to each job and will save to the system, keeping position once reloaded in future. Click here more information on 3D objects! 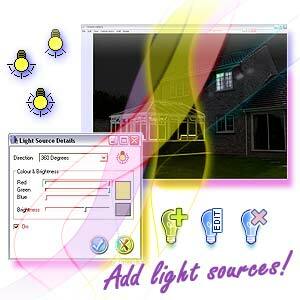 This exiting new option allows you to add up to 4 extra lights to the scene. This can help create the perfect 'Night time' overlay and to cast coloured lights within a scene, thus increasing realism. Conservatory Information window that displays volume, floor area & more.. The volume and pitch are accessible on the screen where you specify the conservatory dimensions and on the overlay screens via the new 'Conservatory Information' page. All other options shown above are contained within the 'Conservatory Information' page. Astounding new reports! With scaling, more detail and bringing the total to over 50! Even more reports, with extended information and scaling abilities. 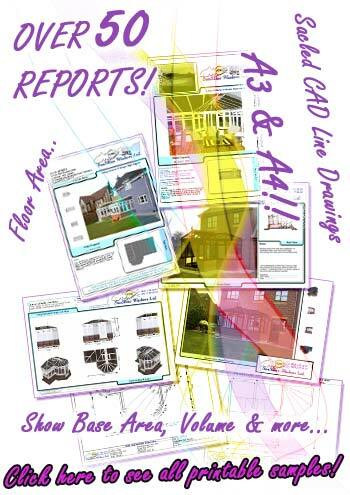 The software now contains 52 powerful high impact reports. 18 new hip back conservatory designs have been added to the system, spanning across the Victorian, Edwardian and Gable conservatory types. A new Gable side design has been also added to the latest service release bringing the new total to 224 Conservatory styles for ComfortableConservatories v2! Configurable facet sizes, opening roof vents, down pipes and lots more! Adjustable facet sizes. Adjust any facet size and then other facets fall in to place. Roof vents can now be displayed open or shut. Down pipes can be added to any conservatory side and displayed on reports and on-screen. Numerous changes under the bonnet to optimise the system. To compare features from all ComfortableConservatories versions and Digital Conservatories versions, please click the comparison PDF button to the right.